So feeling somewhat down for not posting yesterday, I’ll be posting twice today. I thought I’d gather up pieces to going toward the potential new decks I wanted to build. This will be a relatively quick and picture heavy post so bear with me. 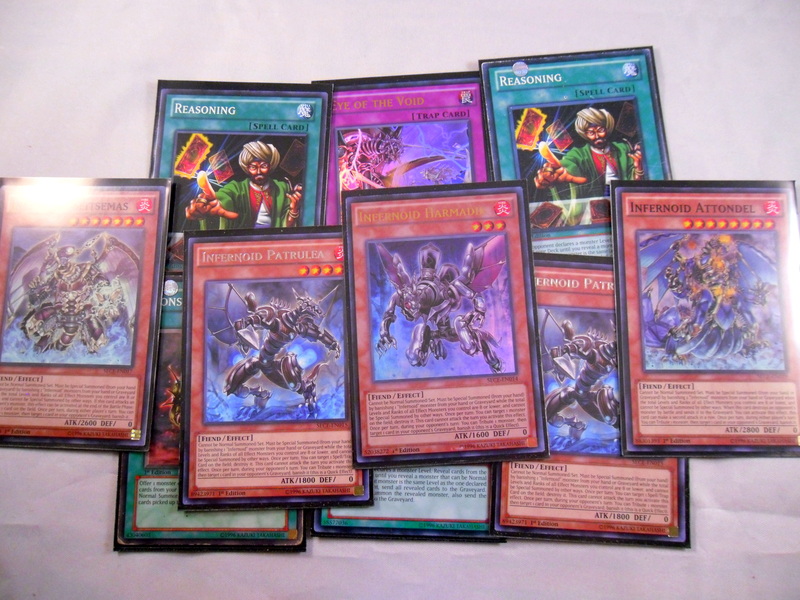 I would honestly try to build the deck if I can get some Ununcus and Harmadiks. However pre-YCS hype has Harmadik trending around $25 (see tcgtrader as of 1/28/15). I only have what’s pictured. 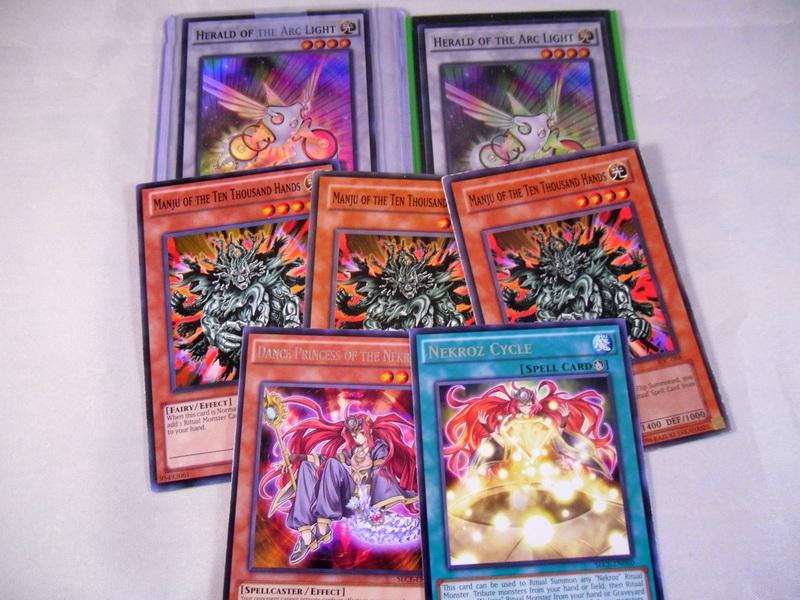 I don’t have Djinn Releaser of Rituals which hurts since preventing Special Summons breaks the current state of Yugioh, but depending on how my Secret Forces Box goes there may still be hope. 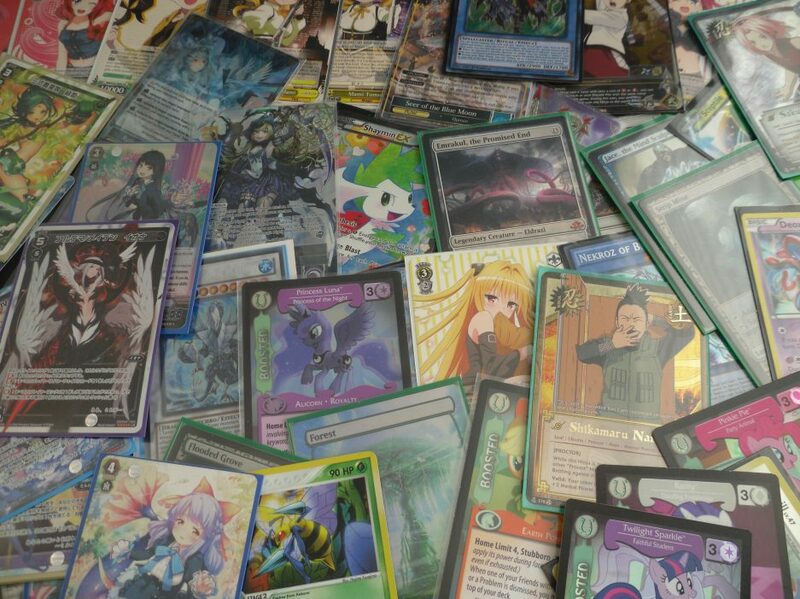 More or less this is my fan-made Jaden/Judai Yuki deck. It’s traditional format (don’t freak out) and was built around always having fusion options. 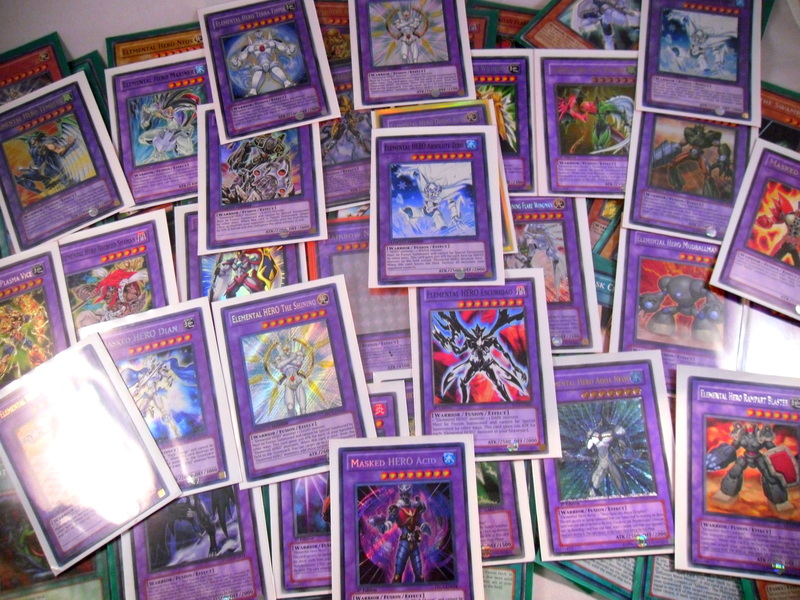 While I’d love to discuss the deck in full for time’s sake I’ll just say I have a lot of old Hero cards. So that’s where I am currently. However tonight may still decide what deck I build. I got a 2nd SECH box (for about $20 less than the first one). I’ll post whatever I pull later tonight. Here’s hoping for a few more Infernoids! 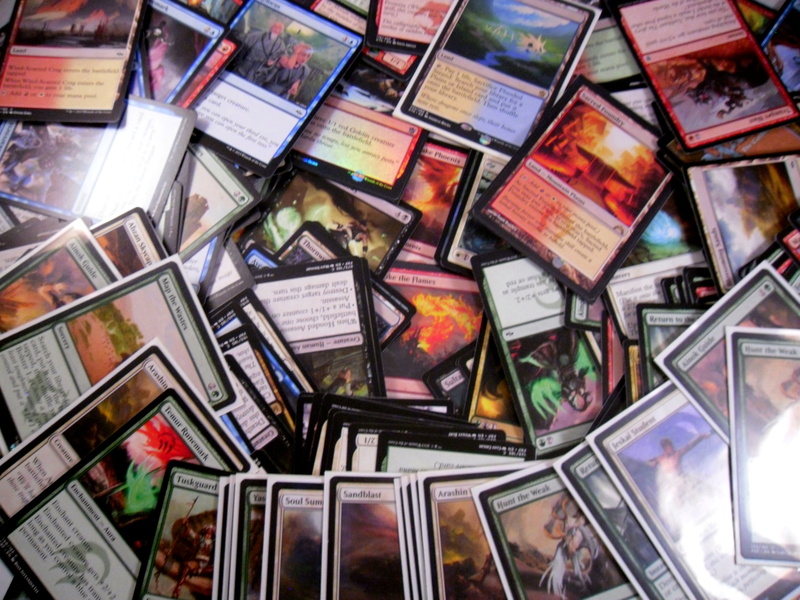 What Magic the Gathering deck will eat all my money? 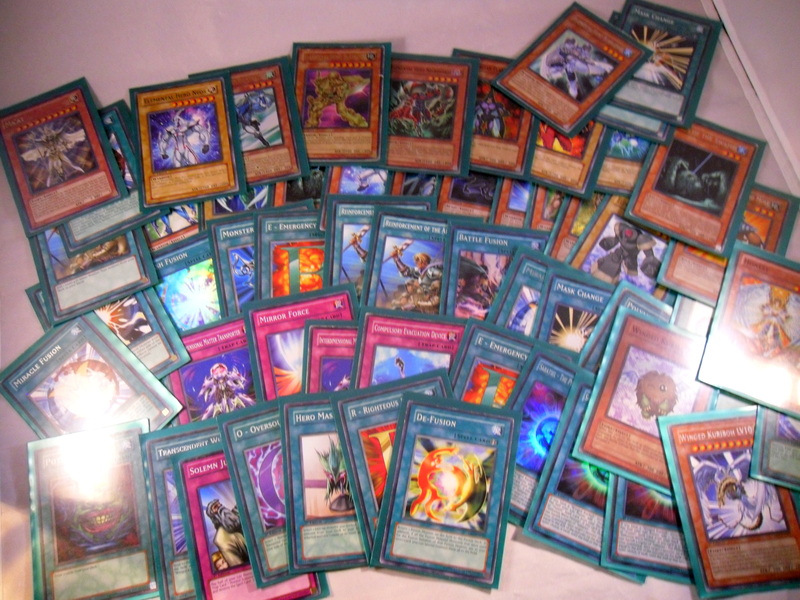 So after taking forever discussing my Yugioh plans, I also want to discuss not only my Magic Plans, but also the Magic deck I’ve been working on and the deck I know want to build for Standard. 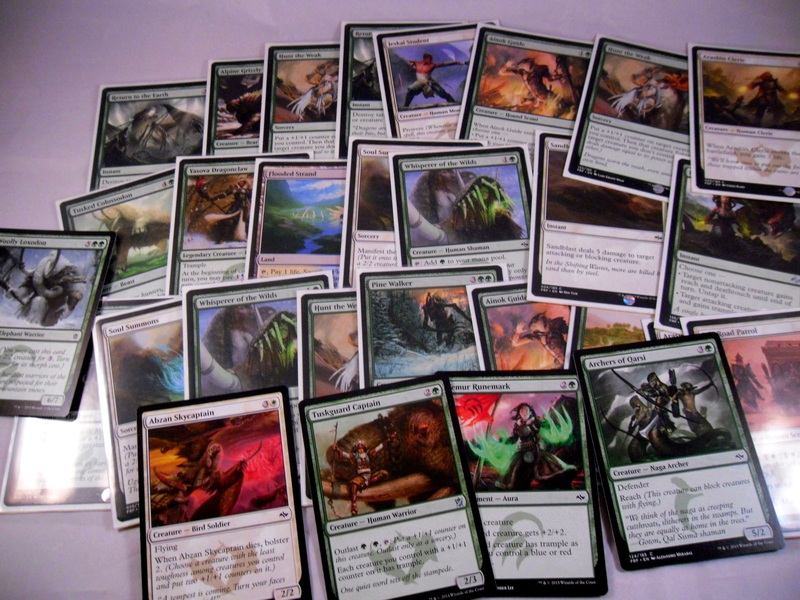 I started Commander during the summer of 2014 with Vorel of the Hul Clade as my commander. My deck was Simic EDH based around generating an absurd number of +1/+1 counters with Vorel. 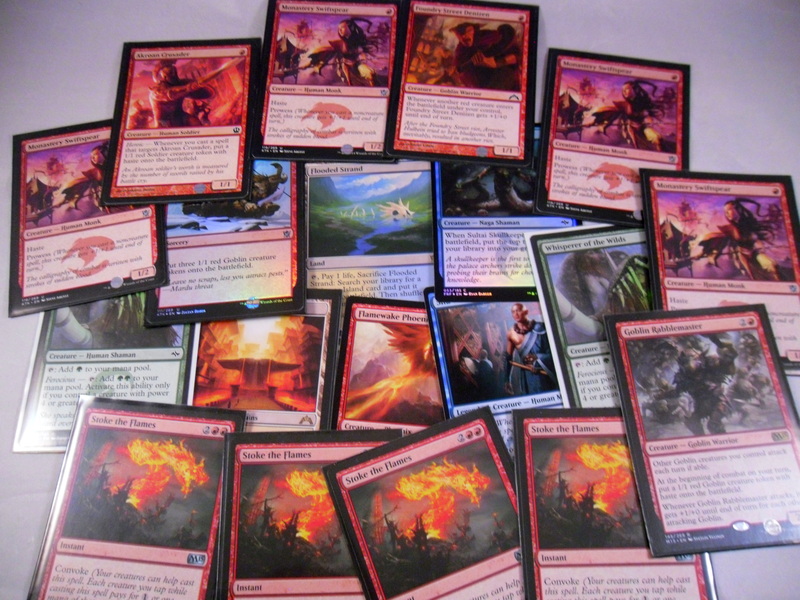 I then moved to Sidisi, Brood Tyrant when Khans of Tarkir was released and made a tri-color Dredge deck. However, when I learned of a potential EDH tournament I bought and modified the Commander 2014 Daretti, Scrap Savant deck. 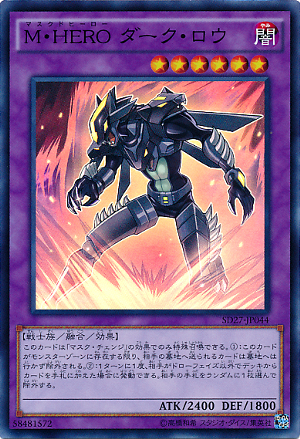 However, in between Daretti and Sidisi I found the card Progenitus (A 10/10 Legendary with “Protection from Everything”). 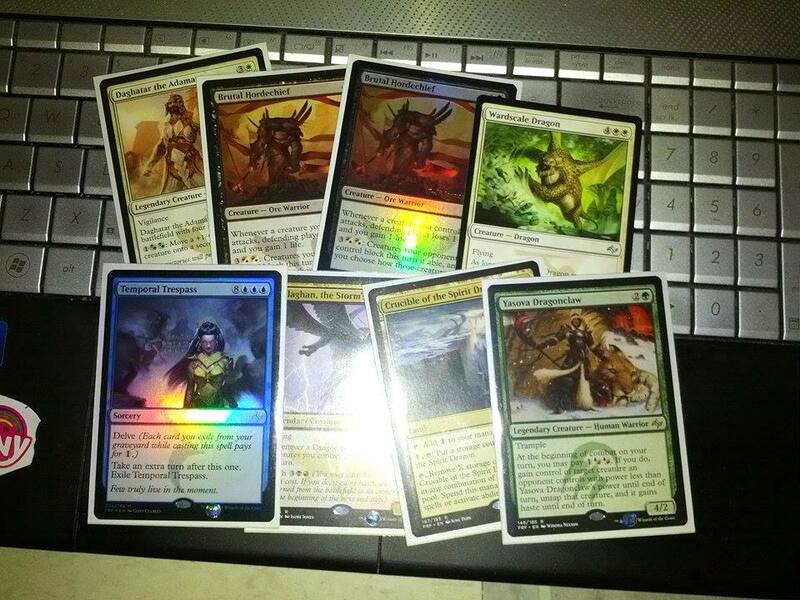 I fell in love at first sight and tried to make 5 Color EDH. Eventually, that deck evolved into the 5 Color Superfriends deck I have today and I haven’t gone back to any of the other Commanders in months. My deck list can be found here. My magic ambition became simply strengthening this deck, through the slow accumulation of boardwipes, dual-lands and planeswalkers. All that changed however when I met a man at my locals who showed me Modern. My current modern deck is a Elf Green Devotion Deck I modified from the first Magic deck I built back in 2013 (I got the Yeva, Nature’s Herald deck and turned it into a Hydra ramo deck). 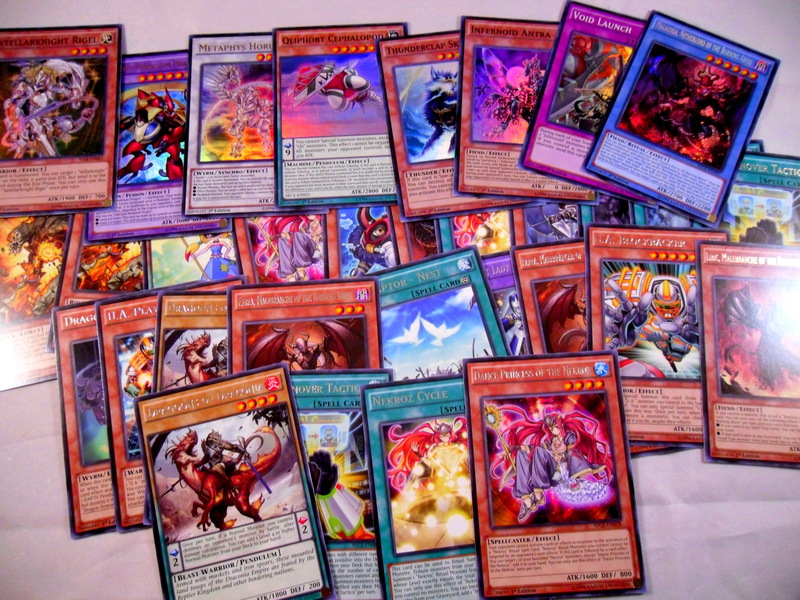 My current deck list can be found here. I have no plans to spend a lot of money making this deck good at the moment, but I do want it to be playable. Despite my 2-2 record at the Fate Reforged Pre-Release I feel blessed to have pulled 2 copies of Brutal Hordechief (one of which was my promo). After playing Mono-Red I want to keep playing faster more aggro decks. 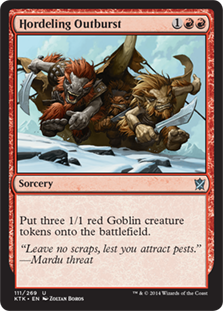 Furthermore, I’ve come to love the Mardu clan from Khans (I defected from Sultai) as their hyper aggressive battle style is the most fun to play (in my opinion). 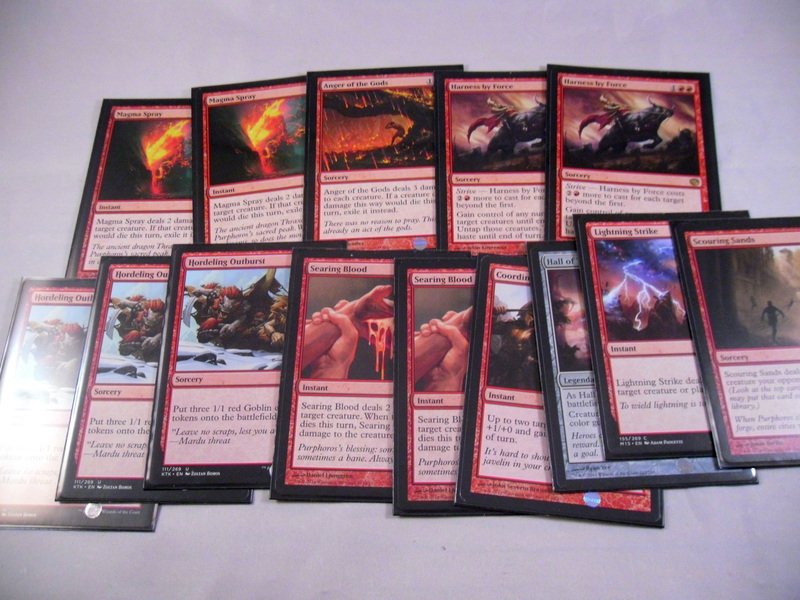 So for magic my choices as of this moment are between Straight Mardu, Black/White Warriors or Black/Red Warriors. I know that Brutal Hordechief can be made a win-con and really want to use him as one. So I have a Fate Reforged Box in the mail. Depending on what I pull from that box I’ll decide on a deck to run with. I’m hoping a few copies of Mardu Strike Leader are in there as he’s pretty much necessary along side the Mardu Shadowspear. Prior to that I’ll be mulling over how to use and abuse Brutal Hordechief. If I go anywhere in Standard I want it to be with him. I’ll hopefully start doing regular deck discussions either tomorrow or later this week. Have a good night and thanks for dropping by! Reinvigorated by a shower and copious amounts of sugar I can retell the actual events of the PPTQ. It was a 5 Round Swiss tournament for an invitation to the normal PTQ (with other prices such as money, and boxes of Fate Reforged). I was incredibly anxious as the round started. I’ve followed what decks were topping (and I knew my deck had become a rogue deck). 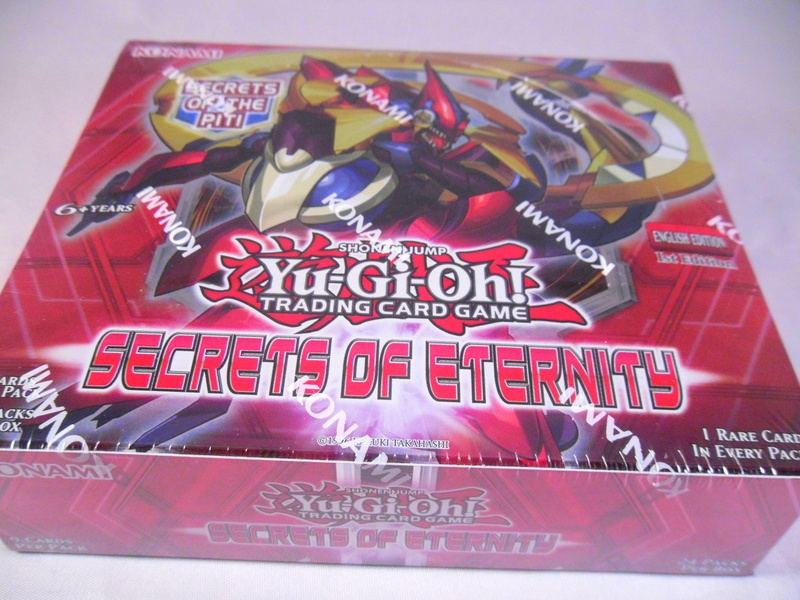 Still what I quickly realized was that I was doing with Magic what I did at every tournament for Yugioh. I went there with a power-creeped deck and would have to struggle to win. Somehow resolved by this logic I began the first round. My opponent was playing an Abzan Midrange deck edited with new Fate Reforged cards. Game 1: I lost game 1 to one such card Tasigur, the Golden Fang, whose’s 5 toughness proved to hard to remove. Game 2: I opened the perfect Akroan Crusader Rush and dealt 12 damage on turn 3. I gamed him well before he could establish his board. Game 3: My dream team was drowned in sorrow before Siege Rhino stomped me into oblivion. My opponent was playing Sultai Whip (also with new Fate Reforged cards). Game 1: Looking back on my life total and notes all I can tell was that I won the game using Rabblemaster and dealt 13 damage in one turn. Game 2: His Gurmaw Angler and Torrent Elemental crushed me with the devastating Whip of Erebos to back them up (This card kills my deck since Lifelink heals away all the damage I deal). This was the only game I both sided and resolved Anger of the Gods (Which killed Sidisi and her zombie pal, but not the Angler). Game 3: Judging from the life totals I was able to get him down to 7 life before he stabilized with Whip and got back up to 24 beating me along the way. My opponent was playing a very standard Abzan Midrange and he made very questionable plays during the match. Game 1: I won with Foundry Street Denizen as he suffered the dreaded Mana screw. Game 2: So I knew he had Drown in Sorrow in his hand thanks to Courser of Kruphix. However rather than play it he used Ajani Steadfast to ultimate Sorin, Solemn Visitor. The Sorin Emblem did beat me, but I had signed my own deathwish by keeping a hand full of enablers with no turn 1 creatures to play. To clarify when he had Drown I had played Hordeling Outburst in desperation to get a few blockers. He still got me without having to Drown though. Game 3: I swept him quickly dealing 10 damage on turn 3 using 2 Foundry Street Denizens pumped by a sudden Hordeling Outburst alongside a 2/3 Monastery Swiftspear. The game ended on turn 4. This was one deck I didn’t expect to play. I thought Control was dead, but with the new Crux of Fate and Ugin, the Spirit Dragon this guy was trying to keep it alive (Not that he cast either against me I just happened to see him play them during a later game). Game 1: His only offensive card was Ashiok, Nightmare Weaver and I plowed through him. His gain 2 life land was my biggest annoyance. Game 2: I sided out all of my creature interaction (Hammerhand/Coordinated Assault) for Hordeling Outbursts and direct burn. Once again only Ashiok and a well timed Whelming Wave came to protect him and again I ran right through him. My opponent was playing control based around Elspeth, Sun’s Champion and Pearl Lake Ancient. Unfortunately for me he said that he lost to a mono-red deck earlier that day. From that loss he learned how to perfectly counter my deck. Game 1: I dealt him a steady amount of damage, but he quickly put an end to my tactics by using Banishing Light on my Akroan Crusader. Eventually once, Elspeth came down I was done for. Game 2: My dream team suffered at the hands of End Hostilities before Pearl Lake Ancient finished me off once and for all. Ultimately, I went 2-3 and took 17th in the 25 person tournament. I was upset, but not surprised. My Mono-Red deck could push out explosive amounts of damage, but in such a life gain heavy format filled with high toughness creatures it just couldn’t win consistently. I’m very happy to have had the experience of playing in a PPTQ though and would definitely enter another tournament in the future. However, before doing so I need to make a more competitive standard deck (even if that means finally biting the bullet and acquiring the expensive land base needed for any deck in this format. So after the draft last night a buddy of mine told me that he was heading to a Preliminary Pro-Tour Qualifier in Boonton New Jersey today. Claiming it to be a mere train ride away I decided to go with him on impulse. 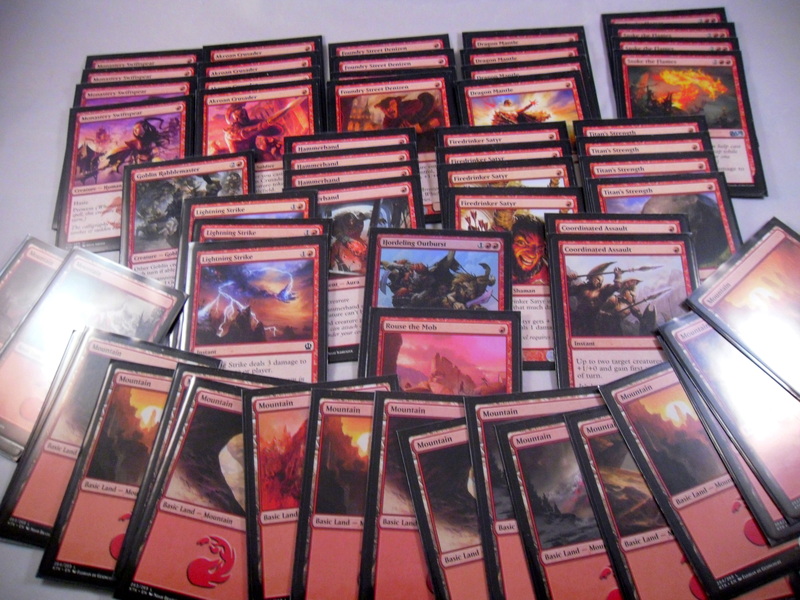 I had a Mono-Red deck built for standard, though I barely ever playtested it (since my magic experience is limited more or less to drafting and EDH with friends). I knew getting wrecked was in my future, but after having gone to 3 official Yugioh tournaments in life (at some point I’ll reminisce I promise) and not a single Magic tournament I felt today was a good time to start. So before I talk about cards I need to discuss how the local train doesn’t actually go to Boonton on the weekends, but you can still buy tickets on that day for the train that will never come ($12 wasted off the bat). Luckily, my buddy had the Uber app and called us a taxi to the place. We made it about 5 minutes before the event started (writing out a decklist that fast was a pain). However, luckily we made it with enough time to enter and compete. Before I go into my matches, I’ll try to fully explain my deck. I started by netdecking a Mono-Red deck that got 8 in an LA regional back in October. I’ve been tweaking it ever since. Some of the following explanations are specific to this event, but as I’m running on fumes it’s the best I can do right now (relevant links are included). The basic plays in this deck focus entirely on Akroan Crusader. 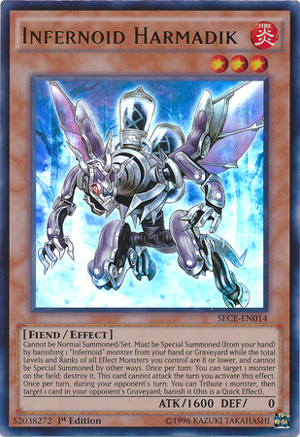 I swear he was the best card in the deck. His Heroic trigger to summon a 1/1 solider (with Haste) won me almost every game I actually took with this deck. Essentially Akroan Crusader was heart and soul of the deck while Monastery Swiftspear and Foundry Street Denizen are tied for second best. 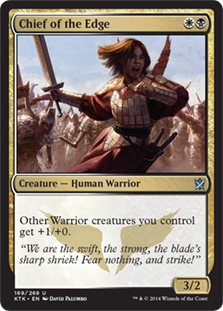 Swiftspear was the strongest creature in my deck as her Prowess allowed her to get bigger when I played spells on Crusader. Foundry Street worked similarly as the soldiers summoned by Crusader triggered Foundry Street to raise his power. After moving past the wonder trio the rest of the deck was mostly good red cards and Heroic enablers. 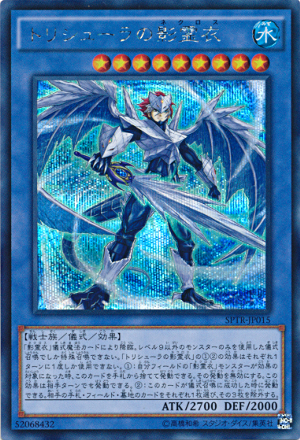 The MVP of red spells in this regard was Titan’s Strength. It gave Swiftspear a net +4/2 for 1 mana and allowed me to hit for absurd damage on turn 2-3. No other spell helped me deal as much damage (though Coordinated Assault came really close). Last cards to discuss are the expensive cards (both cost-wise and mana-wise). Goblin Rabblemaster proved to be amazing when dropped on curb. If I played him after the opponent had a blocker for the goblin token however it usually was all for not. Stoke the Flames was moderately useful, though I winded up siding it out in some match-ups where 4 damage just didn’t kill anything (see Gurmaw Angler and Siege Rhino). Lastly, all but once after resolving Hordeling Outburst did I manage a blow out victory (best time was giving +3 to 2 Foundry Street Denizens and swinging for 11 on turn 4). Siding in only one color is kind of a joke. Furthermore, with my limited knowledge of how to side I’m not if I made that many optimal choices. Some sides like Hall of Triumph or Searing Blood did well in one game, but match-wise it always came down to my Akroan Crusader, Monastery Swiftspear and Foundry Street Denizen to actually win me any games. Ok, so now that I’ve discussed my deck for a bit I’m going to make another post about my matches in the PPTQ and then a 3rd post about the draft I entered after the qualifier ended. I won’t rest until I sum up this full day of Magic (although I really want to! ).